Home Expert Advice Skincare Advice Paula's Choice Product Tips Beauty Boost: What’s a Booster & Which One is Right for Me? Every great skincare routine should include cleanser, toner, leave-on AHA or BHA exfoliant, daytime moisturizer with sunscreen, and nighttime moisturizer. Beyond those basics for all skin types, additional products should address your specific skin concerns—and that’s where boosters come in. 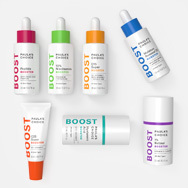 A booster is a targeted skincare product that focuses on the unique capabilities of a particular ingredient that's used at a higher concentration. Boosters target specific skin concerns like enlarged pores, dehydration, dullness, loss of firmness, and so on. They work with your other skincare products, allowing you to customize your routine so you can quickly achieve the exact results you want. If you’re someone with a range of skincare concerns, don’t worry—it’s fine to use more than one skin-booster. All of Paula’s Choice Skincare boosters are formulated to complement each other. They also work with our leave-on AHA or BHA exfoliants and other anti-aging products (including serums and moisturizers with retinol) so you can build an anti-aging skincare "wardrobe" that works perfectly. Targets: The appearance of brown spots, post-breakout marks, uneven skin tone, blemish-related sensitivities. A 10% concentration of azelaic acid plus skin-smoothing salicylic acid and brightening plant extracts address multiple types of visible discolouration concerns, including those related to breakout-related sensitivies and environmental exposure. The lightweight, fast-absorbing formula is suitable for all skin types and can be applied all over or as a spot treatment. Targets: Loss of firmness, wrinkles, dehydration. Our Peptide Booster delivers an unprecedented combination of eight highly targeted peptides that work with hydrating amino acids and key skin-replenishing ingredients to visibly increase skin’s resilience, firmness, and texture. This lightweight, all skin types booster unlocks skin’s ability to look and feel younger. Our 10% niacinamide (vitamin B3) formula helps minimize the appearance of pore size and improve uneven skin tone. Its light-as-water fluid consistency features soothing agents, antioxidants, and skin-replenishing ingredients to boost its anti-aging benefits. Targets: Red or brown marks, wrinkles, visible loss of firmness. A more potent and differently-textured version of the C15 Super Booster, the C25 Booster with 25% vitamin C is meant to be used as a silky cream spot treatment to target the look of multiple types of discolourations. Ongoing use significantly improves skin tone and texture while brightening ashy, dull-looking skin. Targets: Dryness, dullness, dehydration, rough texture. This blend of nine non-fragrant plant oils, combined with skin-restoring and skin-replenishing ingredients, relieves dry, tight, and/or dehydrated skin. Its fluid oil texture soothes temperamental, red skin—even skin prone to rosacea. Ideal to spot treat dehydrated areas, even around the eyes, and can also be used to enhance your moisturizer during dry seasons. Targets: Fine lines, wrinkles, dehydration, sensitivity. Our boosters can be applied once or twice daily, or whenever your skin needs something extra. Some people like to mix their boosters in a serum or moisturizer; others apply boosters first, and then follow with those products. There’s no hard-and-fast rule to follow; our skin-boosters are about customization. Where do boosters fit into your routine? Cleanse, tone, exfoliate with a leave on AHA or BHA product, then apply the rest of your skincare products, in order from thinnest to thickest texture. Always finish with broad-spectrum sun protection during the day.